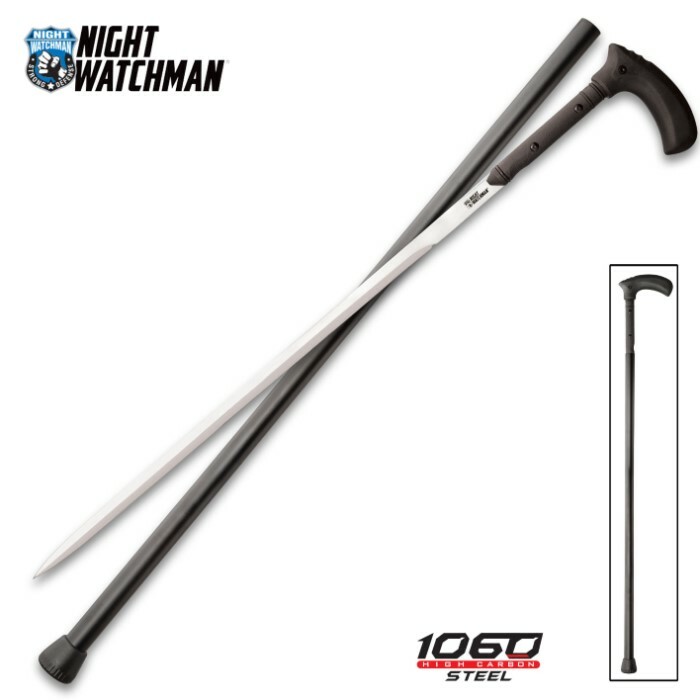 If you are looking for a practical self-defense tool that you can count on, then look no further than the Night Watchman Self Defense Sword Cane. Whether it's to assist you in walking or as an extra measure of self-defense, this sword cane will take care of you. It has a 25" SK5 carbon steel blade. The shaft is black, hard-coated aluminum and the handle is a sturdy fiber filled nylon. The rubber toe keeps the cane from slipping so that you will always be sure on your feet. It is 39" in overall length. Very sturdy cane. Bought it for that but the additional benefits are welcome. The blade itself is top notch carbon steel and reasonably sharp. I’d hate to ever need it but it’s comforting knowing it’s there. I personally did not like sword canes until my wife got this. I must say that the design and feel are much more than I thought a sword cane could offer. I'm a larger person and the cane is comfortable in use and the blade is solid as well. Well done. Just what I was looking for! Appears to be a basic cane nothing fancy which is what I wanted. Sturdy- nice blade- Heavy cane. If you just hit someone with the cane it would do serious damage. Good price. Nice simple look. Serves the purpose of helping me get up from kneeling on floor/ground when doing work and serves as a great defense weapon with very sturdy hidden sword. One of my early Christmas gifts. THOUGHT IT WAS A GOOD PIECE OF EQUIPMENT, DON'T LIKE THE RUBBER ON THE BOTTOM, SLIDES ON HARD WOOD FLOOR, WILL BE CUTTING 2 INCHES OFF OF THE BOTTOM TO GET CORRECT HEIGHT. THOUGHT THE BLADE WAS WELL MADE AND HAS 3 SCREWS HOLDING IT ON, WHICH IS GOOD. NOT CHEAPLY MADE, WELL THOUGHT OUT. My wife bought this cane for me, I have bad knee and she thought the blade would suit my personality well. The cane is great, and I use it often. The sword arrived with just the "factory edge" but it only took a little cleaning and sharpening to establish a good edge that it holds very well. I have 14 canes, and the Night Watchmen SK5 is arguably the best Sword cane I own. I own more expensive and ornate canes but, for fit and function this one stands out as the one that I really could defend myself with, if needed. At 49" it sets a little more up for the taller person, but at least 2 inches could be cut off the bottom for a custom fit. The cane doesn't require unscrewing like other lessor canes but is held in place by tight fitting "O" rings that are easily replaced when worn. Aluminum shaft is very sturdy and the SK5 Carbon blade could be sharper but is not dull. Full tang construction. Worth the investment as a everyday walking cane! I've had mine for a few years, great cane, really has been a help for me since I've been recovering from surgery and just can't do what I used to. Also gives me confidence to still walk where I want despite not being at my physical best. The only problem I've found with mine is just in the rubber o-rings used to seal it in place, but I just went out got some 30 cent ones from a local hardware store, trimmed off a bit and it hasn't come loose with daily use yet. Been a while since I've checked on the blade, but even if mine's got some rust issues so long as you stay up to date on your maintenance I have no doubt the sword will out last the cane. Ok, I've had my cane sword now for about two weeks and I can't say that I have anything bad to say about it. The whole thing, from top to bottom and inside and out is really well constructed. While I'm not in the habit of abusing my toys for the fun of it I don't think there is much that can damage this thing unless you're really trying hard to do it. Even then it'll probably hurt you back, it's mean. The blade is nice and long without being too long. In other words, it's got some reach but it's not like swinging a telephone pole. It's sharp although it could be sharper which is an easy fix. The shaft is pretty hefty as well, you could probably beat a horse to death with it though if you tried it on a gorilla it would just really piss him off. I would have prefered the handle to have been a little thicker but seeing how it has to fit in the shaft I see why it's not. To me it's kind of like swinging a car's radio antenna around, all be it an antenna that could slice someone in half. I wish the cane hand grip was a softer rubber like the ones you'd find on a normal Walmart cane, just because it would make walking with it and putting all your weight down more comfortable. Also, I've discovered that you have to be careful and not let the sword fall out. While it holds pretty well holding it upright and shaking it I can't say the same if it's held upside down. In that case, the sword drops out fairly easily and tries to shave off a little knee skin. All things considered, I still give a 5 star but that's because there isn't a spot for 4.8 stars. So unless you want to spend MUCH more on a slightly higher quality cane sword I would recommend that you get this one.